Every now and then a new artist makes you stop what you're doing and take a closer look. 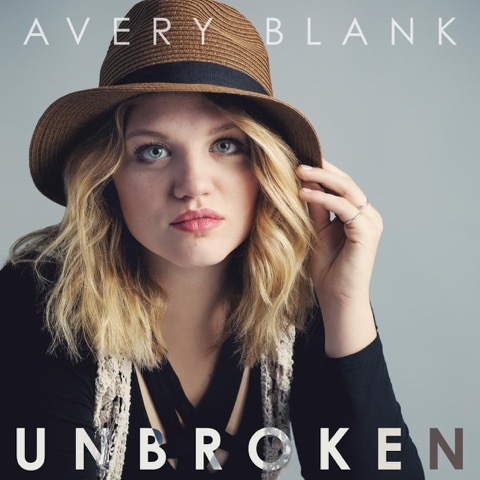 Christian singer Avery Blank is doing just that with her debut single 'Unbroken'. LTTM spoke with her and found out how singing in church from a young age and teenage insecurities helped shape her music. Can you tell us a bit about yourself and how you got involved in making music? I have been singing since I was a little girl in church, never afraid to sing solos in front of people. I was constantly singing, humming or whistling around the house. Still do in fact! As I got older I pursued summer camps that centered around Christian music and learning more about the industry. I had good vocal instruction and some songwriting classes, but even more than that was the pull and calling I felt from God to use the talent he gave me to serve others. From there some other opportunities arose and I have been working hard at writing songs, performing, and recording while also attending high school. God has opened doors and I will certainly keep walking through them if it is his will. What is the story behind your debut single 'Unbroken'? This song came from a very low point in my early high school years. It’s a personal story about a time when I felt distant from God, and in that time I made poor decisions. Like so many teenagers, I felt shame and guilt. I struggled with some depression and poor body image. I didn’t feel like I deserved God’s love. I remember feeling so broken and then my pastor preached a message about healing and God spoke to me that day, releasing my guilt and shame. I remember praying and asking for his forgiveness. I also got the idea at that time for this song titled Unbroken because God brought me out of that dark place. I could hear him telling me that I am beautiful, forgiven and unbroken. I have written and recorded other songs and I do hope to release them. Ultimately my goal is to become a signed CCM artist and make a full album of music that is pleasing to God and ministers to people. As such a young new artist, what has it been like trying to make a name for yourself? To be honest, I am not all that interested in making a name for myself but more about making music that is pleasing to God and to people in all walks of life. This is not about me. This is about the Lord calling me and using me as his vessel. I truly believe that God called me into this industry and I will continue to work hard for his Glory! It will take a lot of work and dedication. If I make a name for myself in the process than he gets all the credit and I would hope that others can see him through me. I definitely love contemporary christian music and consider it my style of music. I have so many CCM artists that influence me! Too many to list honestly! I also like country music and am influenced by a lot of country music artists as well. My biggest influence is God and his word. When I spend time listening to him and talking to him I can get ideas and write songs that I hope are relevant and will speak to others. I have so many CCM artists that I admire, it’s hard to choose! I would say for sure that I would love to work with Natalie Grant and Bernie Herms someday! I’ve literally grown up listening to her and I love to sing her music. Seriously though, my list of artists/songwritersthat I would be thrilled to work with is really, really long. When I hear stories from fans that my song has touched them in some way, or brought them hope and encouragement… that is how I define success. I want to keep writing and recording music that lifts people up. Again, it’s hard for me to pick just one! I love Natalie Grant’s “Awaken” album and remember listening to this all the time in the car with my Mom. Right now that song would be Reckless Love by Cory Asbury. What does the next year hold for Avery Blank? God only knows the answer to this question. I plan to surround myself with good people who know more than I do about performing, writing, recording, and all the behind the scenes work that goes on. I plan to be like a sponge and soak it all in. I plan to continue to work hard on my craft. My prayer is that God keeps leading me in the direction he wants me to go and in good faith I will follow.